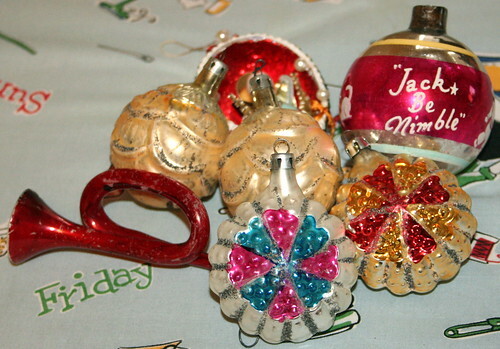 Vintage Christmas Ornaments, originally uploaded by Temeculamom. Guess what I found at an estate sale this weekend? I was so surprised to see them, because I only ever see them at flea markets, and then at prices I can’t afford. So I was happy to fork over $5 cash for these babies. I really love the little pine cones with glass glitter. I have a friend in Missouri who gets big boxes of gorgeous ornaments for like a dollar each. You should definitely check out her blog! ~ by bekaboo on February 8, 2009. So jealous! I love those, what a bargain! Omigosh Bek those are so pretty. I have such a thing for vintage Christmas ornaments! I especially like the red trumpet! Good Score/find Beka. I would so love to go thrifting with you. Beka, I finally found your blog after searching through my comments. I emailed you but it bounced back. Even though it was a reply to your email it said it didn’t go through. I don’t think I ever had your blog bookmarked. If I did it got lost in all the computer madness. Oh well, now that I found you I will be back. Love the ornaments! you scored!! I like the jack be nimble one..
With stage 4 cancer there is never a cure, they can treat us and hopefully we can live for a while (a long while) but really there is no cure. I am glad that your friend is feeling well right now though. Be there for her. It is not an easy thing. Awesome! I love that little horn. I only WISH I had the chance to get to sales anymore to find these for a $1 a box, lol! Destructo boy would be oh so helpful buying ornaments I’m sure!